However, a little good will goes a long way and it’s distinctly lacking in some quarters. Three times recently I’ve got into a pre-booked taxi to find the meter already running. In all fairness, as soon as I expressed my incredulity to the drivers concerned, they backed down and reset their meters, and with at least a mumbled apology. In the first instance, the driver admitted he’d got the pick-up time wrong, but until I actually mentioned his error he was in an almighty grump with me without expressing his reason; in the second, the driver had started the meter while waiting for me to emerge from entirely the wrong address, but kept his meter running even when he came to the right one; and in the third case, the driver claimed I was a minute late. One minute. I wasn’t, it was his clock which was incorrect, and when I challenged him on this issue, he hastily restarted his meter. Still – we’re talking one minute. The point is this – taxi drivers are too damned quick to make you pay for keeping them. At least as many times as I’ve been supposedly ‘late’ getting into a waiting cab, I have been left waiting for taxis themselves to turn up, sometimes for a ridiculous amount of time – not once have I been offered compensation for the time I spent waiting on them, ending up late at my destination in the process. As I said to one of the drivers, it should cut both ways and if not, it’s a diabolical way to treat customers. No matter who they are, a customer is a customer and right now taxi drivers need all the friends and custom they can get. This entry was posted on October 18, 2010 at 11:27 am and is filed under Rude Things, Shopping, Travel, WhingeRantMoan. You can follow any responses to this entry through the RSS 2.0 feed. You can leave a response, or trackback from your own site. Great points. I feel a little the same about rude waiters. not making an excuse for poor waiters but waiters get paid piss all. but yeah – cabbies clean up so they can bloody well be nice to us. Here in Dorset there’s a haggling process for booked cab journeys that I’ve only recently discovered – they give you a ridiculously high quote, you halve it and they add an extra £5 or £10 to settle on a final price. Mind you since I’ve discovered this they are a lot less pleasant on the phone! Country Man’s Wife – at least taxi drivers tend not to spit (or worse) on your receipt or your change. I’m too scared to complain to waiters, especially when there’s still food to be served. Oh yeah this always happens to me in Dublin – they never know where they’re going. Then once you’ve given them directions to the door they go, ‘Oh yes, I know it!’, with a proud grin on their face. Also had a Dublin taxi driver take me completely the wrong direction through town making us late for reservations. Eventually we got out and walked and he still charged us €15! Wherever I am, I always ask for a price before I get in. Good points. I’ve only had two outrageous experiences with taxi drivers but then again, I may not have been paying attention to getting overcharged by others. lifeintheboomerlane – that’s another thing, I’m now so alert to this that I can never really enjoy a taxi journey anymore. Let me know how you get on – it doesn’t *always* work – no chance after midnight and/or too many drinks! I actually doubt it’ll be greeted by anything but guffaws or abuse over here – but I’m going to try anyway! I do like your post. I face similar issues with autorickshaw drivers in India. Manila is pretty much a free for all unless you’re on the ball yourself. Tourists, expats, et al are more highly likely to get the dark meter, and a heft price at the final destination, wether or not you had to help the driver find the way there. Not always the case, but worthy of note. It’s the trips in typhoon weather, late at night, or longer rides that it’s ‘Let’s make a deal’ time, and be assured, if you’re not local, you’ll be paying three times the going rate, minimally. Be nice, be firm, and do the deal before you get in the car. Best practice all around! This is so true, nice post dude! A better question would be, why do all (NYC) cabbies stink like cabbage? Consider yourself lucky. In Italy, they’re allowed to charge you from the moment they leave home (or prior destination), and you have no idea where that place is — Even when that practice has been abandoned, they still do it. And, when the get the time ‘wrong’, they’ll argue or leave you on the street at 5am while you’re now running late to the airport. It’s incredible – they act this way the world over — I’m sure there’s a TAXI – INSAPIENS race out there. Count your blessings that you can afford a taxi. And waiting, for anything, is good for the soul: It makes you think. Preferably not about your taxi driver. As to your question why a taxi driver’s time is more precious than anybody else’s: Because he has to finance the car, petrol, insurance, etc. As he and his car are possibly idle for large parts of the day, he has to try to get the most out of the few hours that he can sell himself. Only scarcely related, when I worked as a lawyer and billed by the hour, I almost wondered why some prostitutes charged more than me per hour… (according to what I read about them). In Dublin, you can at least talk and argue with the cabbies. My worst experiences were in countries where I didn’t speak the language AND had no idea where I was being taken. I am most angry about the Palestinian taxi driver who took me to Erez crossing to get me into Gaza and then left as soon as Israeli soldiers showed up. I had to walk back a couple of miles to find a bus stop. On a 4-hour taxi ride from Beirut, Lebanon to Damascus, Syria I caught pneumonia because despite a snowstorm, all the other passengers were chain-smoking and therefore kept all the windows open. To make matters worse, one of the passengers started to praise Hitler when he found out that I was German. My best experience was in Iran: I went to the airport with a taxi, the fare was a couple of $ for a 30-minute ride. I only had large cash and the taxi-driver not enough change. So he suggested that I check in first, drop off my luggage, get some change and come back outside. He did not want any collateral, he did not charge for the waiting, incredible! I lived and worked in Thailand a few years ago and quickly learned to negotiate a price before getting in the taxi. If the driver thinks you are a tourist, and if you are quite a distance from your destination, expect him to quote a price twice the amount that is reasonable. Never get in a taxi there until you have an agreed price. The traffic is so congested, especially along Sukhumvit Road, that it can easily take 45 minutes to an hour for what would normally be a 10 minute trip. Being late for an appointment or an event due to traffic jams was considered a normal part of daily life. I always carried a book to read and learned the value of just chillin’ through it all. I live and work in NYC – so I feel your pain. Congrats on being Freshly Pressed! I agree.. although in NYC out cabbies are a bit easier to hail although you have to hop in before you tell them you want to leave Manhattan… They hate crosses bridges to get into the outerboroughs. You would think that you have asked them to give up there first born as an offering to the sun gods or something. I never take taxis. I take the bus, train, car, walk, hike, jog, crawl, bike, or do anything except take a taxi. Their rates are horrible. And usually the trip is just as horrible. I completely see your point. The Taxi Driver should not be complaining in the first place. It is because of customers that they even have a job to begin with. If they are complaining about you being late then you should also be complaining about how late they are. Manners is something many people in general forget. I have met a couple of very rude, arrogant, scrooge like taxi drivers in my city as well. It’s extremely frustrating but not much other than a complaint can be done. Maybe it’s the location. I hear there’s a lot of taxi metres in London, I’ve experienced them in Newcastle, and as you say, in Dublin. But where I live, here in rosy, old Yorkshire I don’t think I’ve ever seen a taxi meter. It’s all fixed price journeys, and even then you haggle. Or occasionally get out and run for the hills if you’re drunk and strapped for cash. I don’t do it often though I promise. I rarely ride taxis; however, I have observed similar phenomena in many other contexts. Generally, I suspect that many companies, handymen, whatnot, get a sizeable part of their profit from overcharging, creating artificial work (car repairs are particularly vulnerable), or similar. I live in the suburbs, so I rarely need a taxi. That said, this was a great post for me as I will know to pay close attention any time I do need one. it’s the same way if you are late to a Doctor’s appointment, you get charged for being late but no compensation if they cancel or make you wait for hours. When I make my journey to England, remind me not to book a taxi. I’ll rent the Mustang or Merc that I’ve been planning on renting anyway. Now I hope my Garmin does Great Britain. I got the the “time equals money” attitude with many taxi drivers in Taiwan. One driver was zooming recklessly around every street lamp. vehicle, person, or dog like he was being chased that I thought I was going to crash and die. i’m studying in Cairo right now and there are two types of taxis here. white: they run a meter, so its easy. black: they don’t, so it’s fun. if i know how much a specific trip in a black taxi should cost, I just get out, give them what it should cost and if they argue, hoping to get a few more pounds out of a foreigner, i drop the money on the seat and walk away. so far none of them have followed me out! doesnt apply here in Manila..
nice post, customer services is going downhill these days really, especially with cabbies. here in shanghai they have to go by the meter, it’s regulated but they can really fuss about u-turns. the driver will say i can only drop u here because of so and so reasons. the motorbiker-cabbies are much worse actually although commuters who are quite late for work usually have them as saviours for the day. The DOUBLE STANDARD pisses me off too in all services rendered. My biggest pet peeve: waiting after an appointed time, whereas you might lose your spot if you are late yourself, e.g., doctor, hair, etc. Peace and congrats on Freshly Pressed!!! I had my own difficulties with cab drivers in Springfield, IL. For one thing, they don’t assist a handicapped person with crutches. When that person fell while exiting the cab and the crutches went flying, he never got out to either assist or inquire if she was hurt. When my daughter was late getting out of the house, she told him she needed five minutes. He left. Time is money and chivalry has all but disappeared except ifor the senior generation. Very interesting post. I feel grateful to have had quite pleasant experiences here with San Franciscan cab drivers. They usually ask if it’s alright if they take such-and-such route before I get jipped out of a few bucks. I’m usually very cheerful and polite getting into the cab, so maybe that softens them up a bit? Must be those Priuses they drive. That’s good to hear. I have to say, most Dublin taxi drivers ask too, which is fine if you know a city well – but I always fear for tourists who have no idea where they’re going. Dubrovnik taxi driver queried about the fare launched into an extended rant about the beauty of the car and the sort of high class passengers he should have and lambasted us calling us hippies. He even made comments about our marriage! and our bags which he hated apparently. Having dropped us he did a u-turn and then stopped the traffic to hurl more abuse out of the window!! In the end he got the traditional Anglo Saxon farewell. What a ‘lovely’ experience – I hope it didn’t put you off Dubrovnik and the rest of your trip went well. Being surly is one thing but making it personal (even to your luggage!) is going too far. Cabbies are interesting aren’t they? Every time I get in one, I get something different. One time a man got out of his cab to put my luggage in the trunk but before he opened the trunk, he pulled his pants up high enough, zipped them and buttoned them. I REALLY don’t want to know what he was doing before he stopped to pick me up. Ewwww! Some are just downright greedy and opportunistic, though in all fairness there are people like that in all professions. I once shared a taxi with someone (here in Australia) and my fellow passenger was taken to her destintation first – tab at drop-off was a little less than $10, so the lady handed over ten bucks and didn’t get any change. Once I’d reached my destination, the tab was @$13.50 – so obviously my portion of the journey cost $3.50 more than what he had already received. The guy said “that’s $13.50”, meaning he’d receive a total of $23.50. “I think not”, said I, “I won’t be paying you twice.” To which he replied he’d be kind enough to ‘let’ me have the fare for only $10 instead. I could not but laugh at his ‘generosity’. I think you either laugh or cry at someone with such a neck. More front than Harrods, as they say. taxi drivers and bus drivers think they own the streets because they work them. I also resent the “flag fee” – I don’t mind paying it if they have to come to me – but when I am on the street and wave one down – they didn’t go out of their way to get to me – so why should I pay just to get in? I’ve never even been in a cab. This is why. I studied abroad last semester in Dublin and we were told that if you think a taxi driver was overcharging you to solve the problem by asking for their license and taxi certification number. Thats when they would vastly reduce the price. They try to trick you! However, I had a good taxi experience from Dublin City Centre to the airport. I was taking a trip to mainland Europe one week and I was waiting for the Airport bus to pick me up at around 4 in the morning. I realized that at that time the bus only came once an hour during the early hours of the morning and I did not realize that. However, a taxi driver came around saying he would match the bus tickets price (7 euros i think?) and would drive me to the airport. I saved myself a 20 to 30 euro taxi ride. He picked up other travelers along the way too. That was a money and time savor. My husband and I visited his parents in Egypt last month (he’s from there, but hasn’t lived there in over 12 years), and there was a mall about 4 blocks from where we were staying. Because the ride was only about 5 L.E. (~$1 American), many drivers would simply say “I don’t know where it is” because they thought it was a waste of their time. My husband told a nicer driver about that, and he said “Oh, they know where it is, they just don’t want to drive such a short way.” In the meantime, eager drivers will make 4-5 short trips, while the snooty ones will still be sitting there waiting for a fare when the other returns. Who’s making the money, really? The one who will take any trip, big or small. Also, we learned that older cab drivers (there are several types of cabs) will not use the meter, while the ones with newer cabs will, and they will charge you a fair amount instead of you having to guess what to pay them. Good points. I’ve only had two outrageous experiences with taxi drivers. this blog reminds me that incident. anyway thanks for this blog! Great post and I am with you 100% of the way. I haven’t been in a cab in quite a while but you’re right, if they’re late they never take money off of the fare. Double standard! People in many professions just seem to forget about the basic rule of customer service. After all, anyone in business knows that without satisfied customers, there IS no business. Pay your debts! Con artist! Loser! TYLER F LONG YOU ARE A CON ARTIST! I think you should be on Cash Cab: Compensation for Crappy Taxi Experiences edition. 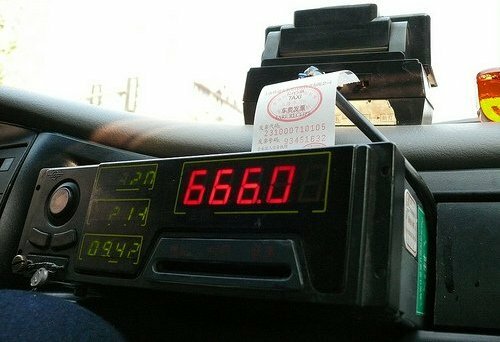 The issue of taxi fares is similar to many things in life. The person providing the service is able to set the price of the fare and will attempt to do so depending on how desperate they think you are. If they feel you have little option but to go with the service they are providing then it would make sense that they charge as much as they feel they can. If however you are able to demonstrate that you don’t specifically require them and that you could go elsewhere then the price is likely to be lowered. The key is to show that you as the customer have control. I read one of the posts up there detailing price haggling and that it was less likely to be successful at certain times of the day or when the customer is drunk etc. In the former case the taxi driver has other customers he can turn to and in the latter case he will look at the situation and likely come to the conclusion that you need him more than he needs you and look to exploit that with his prices. If as the customer we are not needy, desperate or dependant on one outcome then it should be easier to force the hand of the driver into offering a cheaper rate. I know I’ve been kept waiting for a taxi. There was also the time they made me share with someone else going to a nearby destination, and he tried to get us EACH to pay FULL PRICE. I don’t think so, buddy. ryan CHANDELIER attempted to offer an alternative to the typical yellow cab in New York City. Unfortunately, my first customer offered me $200 for a return journey to Boston. I woke up 16 hours later with a bad haircut, a Montreal Expos cap, someone else’s underpants (backwards) and a listing on the FBI’s most wanted registry. Plus the Delorean wasn’t the best for stowing luggage. Uh oh, as a taxi driver I’m a little scared to put my head above the parapets! But it has been mentioned above, but get a quote BEFORE you get in teh cab and that’s what you’ll pay. It’s unbelievable how many people don’t know or do this. And they guy who said taxi and bus drivers think they own the road is a fool. I drive both, as well as lorries, and during training we’re taught to accept any bad drivers on the road with nothing but a smile, yet it is always us that get the bad press! But, back to topic, a taxi driver can only start his meter if the client is late coming out, and as you have said that you weren’t late then the cabbie is out of order. Just don’t tar ALL of us with the same brush guys, please!! A customer steps into the heroes cab at the airport, as the latter is running off to catch his love interest. He makes sure to start the meter, searches through half the airport, and eventual buys a ticket for and boards (!) the flight where she serves a stewardess. After countless events culminating with an emergency landing with the hero at the controls, the movie ends—the poor passenger is still in the cab with an enormous meter count. “Another twenty minutes, but that is it.” (or similar) is his stated opinion. 1. No matter how bad your cabby is, it could be worse. 2. Draw limits for behaviour in time and do not let yourself be a door mat. Drove cab for a year. Nearly every other driver (but me) did this tactic. Most customers are too ashamed of being “car-less” (usually for DUI issues or because of poor driving or because they are scared to drive) to even say anything. Even business customers (airport/hotel suits) are often traveling on the company’s dime and so won’t say anything because it’s not their money. And a good 50% of the people don’t even look at the meter until they get where they are going. I never felt comfortable with it. The company I worked for was a split-book company (you paid 50% of the meter) rather than a rent-per-day company (like most are). So, if I started the meter and it ran $3 on it and then the customer never came out, cancelled the trip, or I was at the wrong address and had to scoot over a few blocks – usually because dispatch screwed up the pickup – then, I would have to eat $1.50. Not doing that. But far more importantly to me was customer goodwill. You make a person feel respected and comfortable and the trip goes better. The conversation is better. The customer might request you personally for future trips. And you will often get better tips on average (not saying money is a good reason for politeness, but rudeness never got anyone anywhere).